*How safe is your car park? Car parks are often unassuming facilities but they can be hazardous environments due to their high level of vehicle and pedestrian activity and must be managed with extreme care. Owners of car park facilities are responsible for the safety of those who use their parking facilities and this issue was highlighted recently in a legal case involving the death of a man who accidently reversed through a safety barrier in a hotel car park in Sydney. This incident highlighted the urgent need for car parks to undertake a safety audit to ensure their facility complies with current standards. In this case, the hotel and council were both found to be negligent as the car park?s perimeter railings used for edge protection failed to comply with Australian standard AS1170.1. The court found that the concrete wheel stops had not been installed properly and the metal perimeter railing failed to comply with Australian standards, contributing to the man?s death. Engineers should keep such issues in mind as these types of incidents are not uncommon. A similar incident occurred two years ago at John Hunter Hospital in Newcastle and while the driver in this instance escaped serious injury, the accident has prompted the hospital to replace its perimeter edging with a load bearing barrier that exceeds current Australian Standards to protect it from a repeat accident. When designing car parks, or any car park infrastructure, engineers should consider the live load bearing of its perimeter edging and ask the question, could the railing withstand a vehicle impact. The current Australian standard dictates that a vehicle barrier should withstand a 30 kilo newton measure of force, which is equivalent to a 1,500 kilogram vehicle (a mid-size sedan) travelling at eight kilometres per hour. Carpark Compliance Solutions believes this current Australian standard is too light for today?s modern family vehicles such as SUVs, and doesn?t reflect the actual car park traffic scenario where cars of all sizes are often travelling at a much greater speed within car park facilities. If one was to consider the consequences of a driver who accidently hits the accelerator instead of the brake and ploughs through a car park barrier at high speed, a barrier that only just complies with the current Australian standards is unlikely to contain the vehicle. In Britain, the standards for car park safety barriers are more stringent to reflect a more accurate representation of a car park vehicle speed which is set at 150 kilo newton, and designed to accommodate the impact of the average size sedan travelling at 20kms per hour.?? By using the common equation of ?force equals mass times acceleration?, there is reasonable cause to consider a review of the current standards. The current Australian standard is prescribed to meet a variety of different scenarios but at the rate of minimum impact force, and for any vehicle travelling at the usual speed, up to 20km per hour, may not be adequate to avert a similar car park disaster to the one that happened recently. When building car parks, the overall cost and solutions that meet the current standards is a consideration, but more education around actual car park activity must be considered to protect public safety. As traffic flows are higher, the perimeter standards should also increase to reflect actual traffic flow. 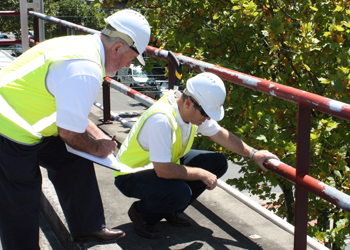 Undertaking a car park safety and compliance audit will help to identify whether safety upgrades are required and ensure the structure is aligned with current Australian Standards. Upgrades that may need addressing include replacing balustrades, new signage, line markings and concrete structural repairs. Review your current inspection and maintenance procedures, and ensure those responsible are aware of the current Australian Standards and compliance requirements. Assess the entire facility, including the exterior perimeter, observing and noting areas of risk. For example, check that perimeter balustrades and vehicle barriers are in good condition with no signs of wear or rust. Review pedestrian safety guardrails along staircases and walkways between levels, and review the need for anti-climbing barriers. This is particularly important to ensure the safety of children. Identify any potential blind spots when entering and exiting, and when driving around the facility. Consider whether high impact end ramp barriers and safety guardrails may need upgrading. Check the overall facility has adequate signage, lighting and ventilation, and that the vehicle driveways line marks are clearly visible. Carpark Compliance Solutions manufacture and distribute a comprehensive range of fully engineered and tested vehicle, pedestrian and industrial safety?barrier systems that meet or exceed Australian Standard AS1170.1. If you have any concerns about a car park facility or wondering if it fully complies with Australian Standards, call CCS on 1300 716 766 or visitwww.carparkcs.com.au.